We reported earlier that Honda 2Wheeler India will launch the much-awaited new Honda CB Hornet 160R motorcycle in the country by this festive season. If reports are to be believed, the bike will go on sale by the end of October. 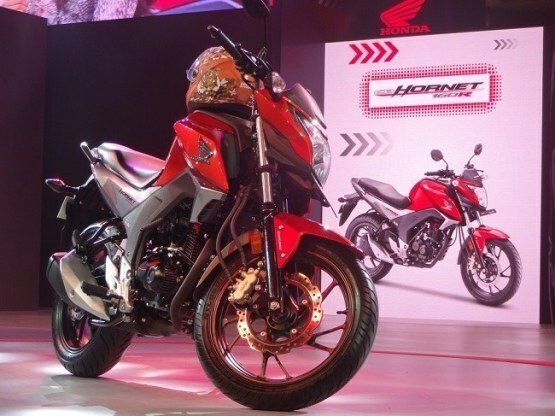 Unveiled at Honda's Revfest 2015, the CB Hornet 160R will be Honda's answer to the likes of Suzuki Gixxer and the Yamaha FZ-S FI. It is expected to be priced at INR 80,000. Powering the Honda CB Hornet 160R is a 162.71cc single-cylinder, air-cooled engine that also powers the new Honda CB Unicorn 160. This engine is capable of producing a top power output of 14.5bhp at 8,000rpm along with a top torque of 14.61Nm at 6,000rpm. Power is transmitted to roads via a five-speed gearbox. It is expected that the bike will get Honda eco technology (HET) for better fuel efficiency, and we expect that the CB Hornet will return close to 50kmpl of fuel efficiency. The new Honda CB Hornet 160R is styling is inspired from the CX-01 concept, which was showcased at the 2014 Delhi Auto Expo. The bike equipped with a stylish halogen headlamp with minimal fairing, high-mounted single-rod handlebar, fully digital instrument cluster with indication light, a black centre piece and plastic side cowls, muscular fuel tank, split grab handles, X-shaped LED taillights and clearshort silencer. Based on the tubular diamond frame, the Honda CB Hornet 160R will get telescopic front fork and semi-loaded rear mono suspension. The bike rides on 17-inch multispoke alloys, while the braking system comprises of disc brakes along with Honda's CBS (Combi Braking System).